Simple. Quick. Delicious. From a cookbook that I highly recommend, Mediterranean Fresh, by Joyce Goldstein. 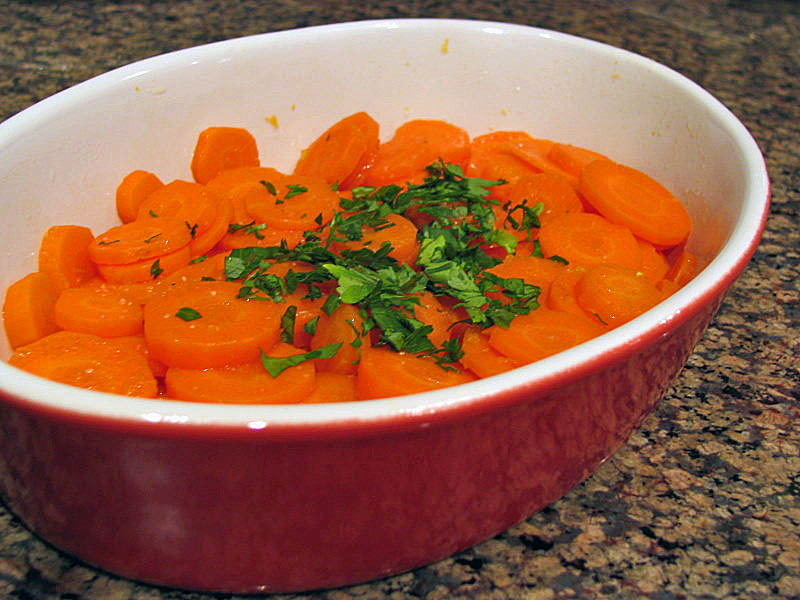 The secret is in the dressing, that pairs citrus and cumin, giving the carrots a very subtle background of heat. Do not skip toasting the cumin seeds. In recipes with so few ingredients, you need to bring out the best in each of them, and toasting spices does just that, makes them talk to you loud and clear. Toast whole cumin seeds using a small non-stick skillet over medium heat, moving them constantly to avoid burning. Let them cool slightly, and grind them. Mix the citrus dressing with the spices and sugar. Peel the carrots and cut in thin slices. Cook in boiling salted water for 5 minutes, or until they start to get tender, but do not overcook. Drain and toss with the dressing. Adjust the seasoning, and add minced parsley just before serving. Serve warm or at room temperature. Comments: If this salad does not appeal to you because you are not fond of carrots, consider making the dressing, because it will go quite well on many veggies as well as composed salads. I can envision my default method to cook asparagus getting a boost from this mixed citrus dressing at the end. The original recipe called for three tablespoons of sugar, I used only two, as carrots are naturally sweet already. The recipe serves 4 to 6 people, I scaled it down for the two of us, but next time I’ll make a full batch to have leftovers. We had just a tiny bit left, which was still wonderful next day, but left me craving for more.